Doyle has consistently refused to answer as to how young the girls were when he tried to molest them. “Ex-gay” therapy is roundly rejected by all major medical and mental health associations, which state that the practice is ineffective at best, and can cause great harm to patients. Many who were among the most prominent spokespeople and apologists for the “ex-gay” movement have recanted their views and expressed deep sorrow for the pain their work caused over the years. 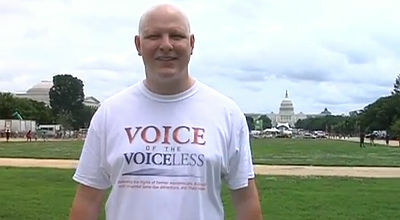 Alan Chambers, who ran the now defunct Exodus International, admitted that 99.9% of those he encountered in the movement never changed their sexual orientation. John Paulk, who was once the poster boy for the movement, appearing on the cover of Newsweek in 1998 with his then wife, now is living as an openly gay man, and is doing the hard work of apologizing to those who were hurt by his work. Most recently, Yvette Cantu Schneider, who was once held prominent roles on the religious right advocating for reparative therapy, recanted her past work and now speaks out as an advocate for LGBT equality. Indeed, the only public “ex-gays” left seem to be those who are currently making money promulgating the “ex-gay” lifestyle. Doyle should use some of that money to tend to his own victims.